In 1959, The Town and Country Planning Association and the fifteen New Town development corporations held a 'New Towns Exhibition' at the Royal Academy Galleries at Burlington House in Piccadilly, London, W1. The exhibition was held between 3rd - 17th October and opened by the RT. Hon. Lord Beaveridge, KCB on Friday, 2nd October, 1959. Glenrothes (Fifeshire, Scotland) and Cumbernauld (Dunbartonshire, Scotland). A special 64 page presentation booklet was produced priced at Two shillings (10p). I was very pleased to be invited to write this forword, because when Minister of Housing and Local Government I was myself for three years responsible for twelve out of the fifteen New Towns in Great Britain. These twelve alone have now been in the care of five different Ministers; and to every Minister in turn they have I think presented a series of problems which were often difficult, but always challenging and interesting. That was certainly my own experience. I have never lost my interest in the Towns, and have recently had the opportunity to revisit some of them which I had not seen for five years. I was much gratified to see the fine progress that these have made, and I do not doubt that progress has been matched in the other Towns too. Above all I was delighted to see the people looking so well and so cheerful in their new surroundings, and the thousands of healthy and high-spirited children; I don't believe you could see finer children than these anywhere in the world. I should like to take this opportunity of expressing my warm congratulations and thanks to the members and staff of the Development Corporations, to whom the credit for this great achievement is largely due. This year marks a milestone in the history of the Town and Country Planning Association. No body has done more to secure nation-wide recognition of the importance of town and country planning; and every Minister responsible for the subject has had cause to be grateful to the Association for their constant and constructive criticism. Indeed, it is largely as a result of the lead they gave that the post war Government decided to promote the New Towns programme. It is therefore fitting that they should mark this occasion by an exhibition devoted to the New Towns. The success which they have already achieved is something of which the Nation can well feel proud and for which the Association can rightly take a large share of the credit. Our New Towns are already well known in many other countries all over the world. I feel sure that this exhibition will help to make them even better known both abroad and at home. I send the Town and Country Planning Association my best wishes for the success of this exhibition and for their own future in the years to come. All fifteen New Towns contributed to the booklet. Basildon's contribution can be read here. 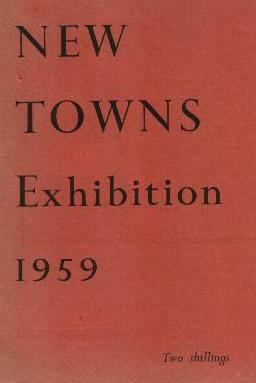 The fifteen New Towns illustrated in this exhibition are all being constructed under the New Towns Act, 1946. Twelve of them, in England and Wales, are being constructed by New Town Development Corporations appointed by the Minister of Housing and Local Government, and the other three, in Scotland by similiar Corporations appointed by the Secretary of State for Scotland. Most of the capital required is provided by the Government by loans repayable over a long period, but some of the factories and commercial buildings and individual houses are financed from private sources. All the New Towns have been carefully planned in advance as self-contained towns not suburbs, but communities in which people have their occupations as well as their homes within easy reach of each other, and separated from other towns by surrounding green belts. They vary considerably, since they are being developed by autonomous Corporations, each of which has its separate team of qualified experts. But all are designed to have the qualities of healthfulness, convenience and spaciousness, good living conditions, and beauty in architecture and landscaping, and to be efficient locations for modern industry and business. The eight towns first described - Basildon, Bracknell, Crawley, Harlow, Hatfield, Hemel Hempstead, Stevenage and Welwyn Garden City - are between twenty and thirty miles from London, and are intended to provide a better alternative to the congestion and continuous outward growth of the capital. Thus they avoid for most of their inhabitants both the crowded conditions of central London, and the long daily work-journeys involved in suburban sprawl. They have been outstandingly successful in obtaining the industries need to provide local employment. The other four New Towns in England and Wales - Newton Aycliffe, Peterlee, Corby and Cwmbran - meet somewhat different local needs. Of the three New Towns in Scotland, two - East Kilbride and Cumbernauld - have the same relation to the overcrowded city of Glasgow as the first eight new towns named have to the city of London. The other, Glenrothes, is being built to meet the needs of the new coalfield of Fife. Most of the towns are being developed on sites almost open or having originally only small populations. Hemel Hempstead, however, was already an ancient borough with a population of just over 20,000. Welwyn Garden City has a special position in that it was well advanced and famous as a new planned town before being taken over for completion under the New Towns Act. Between them the fifteen towns have already provided new houses for nearly 300,000 people, with work places, schools, shops, many other kinds of buildings, and public services. Ultimately they will cater for about 560,000 in addition to their original populations of about 134,000. The movement for New Towns owes much to the lead given by the pioneer private-enterprise industrial villages of Bourneville, Port Sunlight and New Earswick, and the examples of the first Garden City (Letchworth) and its successor Welwyn Garden City. Credit: No credited author. Exhibition book produced by Hazel Evans & published by the Town and Country Planning Association. Comments: Harold Macmillan foreword reproduced in its entirety, unedited and unabridged. Produced here as an historical reference, this exhibition would appear to be of particular significance in that it marked a period of time (in excess of 10 years in some cases), by which to measure the progress and development of the fifteen New Towns. It was sponsored by the Town and Country Planning Association in conjunction with the fifteen New Town Development Corporations, with support and encouragement from the Ministry of Housing and Local Government, and the Department of Health for Scotland.